Choosing and maximising your child’s CDA account. To support couples in their decision to have more children, the Baby Bonus Scheme helps to lighten the financial costs of raising children. This includes a cash gift (if eligible) and contributions to the Child Development Account. 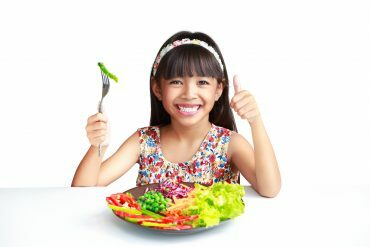 WHAT IS A CHILD DEVELOPMENT ACCOUNT (CDA)? The Child Development Account (CDA) is a special savings account that helps parents save for their children. When a CDA is opened, the child can receive CDA benefits, including the CDA First Step and a dollar-for-dollar matching contribution by the Government. Children of unwed parents who are born, or have an estimated delivery date, on or after 1 September 2016 are eligible to receive CDA benefits. All Singaporean children born from 24th March 2016 onwards will receive an initial $3,000 grant in their CDA. The CDA can be used to offset baby expenses including, but are not limited to; Child Care Centres, Kindergartens, Special Education Schools, Providers of Early Intervention Programmes, Providers of Assistive Technological Devices, Medical-related Expenses (eg. Approved Vaccinations at Polyclinics) and MediShield or Medisave-approved Private Integrated Plans. You can view a full list of approved institutions (AIs) which you can use your CDA here. There are currently three banks which you can apply for a CDA under – POSB/DBS, OCBC and UOB Bank. To help you decide which bank would be most suitable for your needs, here’s a comparison and breakdown of what each bank offers. Other than looking at the interest rates that the bank gives you, you may also want to look at how convenient the bank is for you and the benefits/deals that best suit your needs. POSB Smiley CDA offers 2% per annum (p.a.) interest with no minimum amount required, to a certain maximum amount based on your child’s birth order. The remaining balance that exceeds the maximum amount would be given a 0.05% p.a interest. With the POSB Baby Bonus NETS Card, you can enjoy exclusive deals from participating merchants such as FOX Kids and Baby, GAIA, Le Petit Society, Pororo Park and even Lazada. A full list of the exclusive deals can be found here. If you have a POSB Everyday Card or PAssion POSB Debit Card, you can also get a 3% cash rebate for on-site medical services made at hospitals, medical and dental clinics charged to your card. Valid until 31st July 2018, full terms and conditions can be found here. 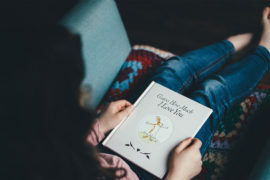 As a welcome gift to new applicants, POSB is giving away a set of four Baby’s First Words books worth $47.60, and a two-year membership at My Greatest Child when you sign up for the POSB Smiley CDA. Promotion is valid until 12th July 2018, full terms and conditions can be found here. I’d highly recommend the POSB Smiley CDA to new parents who love pampering your little one, so that you can make full use of the exclusive deals at retail merchants given! The OCBC CDA probably has the most benefits! They offer a 2% p.a. interest for the first $36,000 deposited into the account and 0.05% p.a. interest thereafter. Similar to the POSB Smiley CDA, OCBC offers a 3% cashback on medical spend for over-the-counter medical, dental and cord banking transactions with a minimum monthly spend of $600 on your OCBC 365 Card – capped at $80/month. 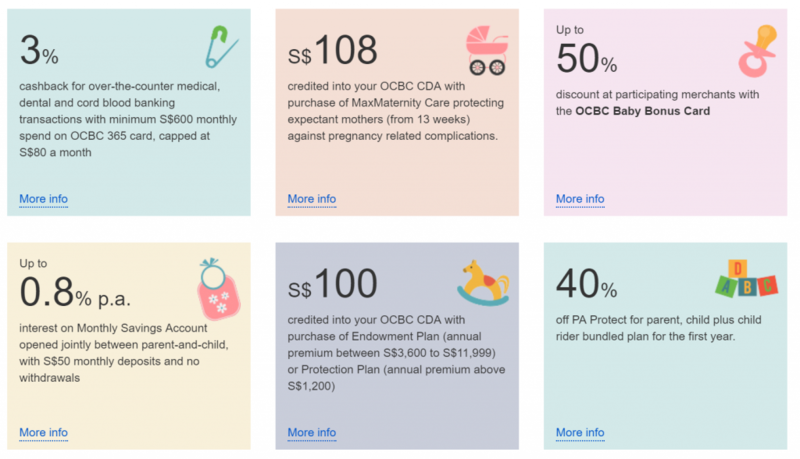 Receive $108 credited into your OCBC CDA when you purchase the MaxMaternity Care, protection for expectant mothers (from 13 weeks onwards) against pregnancy-related complications. 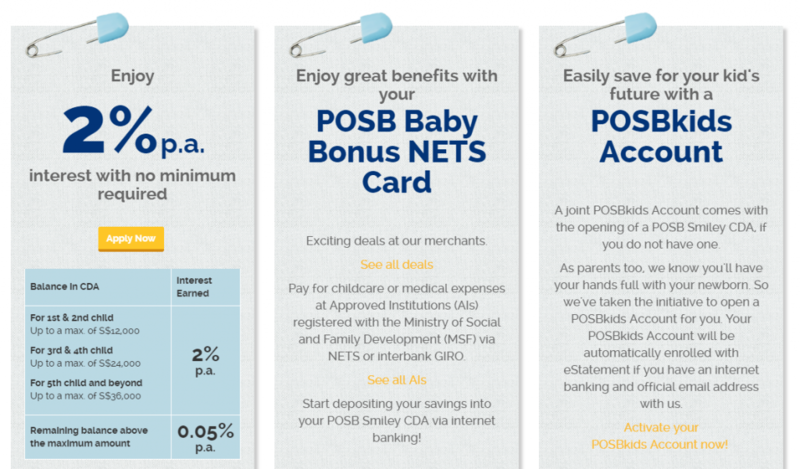 The OCBC Baby Bonus Card also gives you a bunch of perks and privileges (up to 50% off!) from merchants like Busy Tables, Gymboree, Thomson Specialist Centres, Kinderland, MindChamps, Ashley Low Photography and even Fairprice Online. You can view the full list of participating merchants and their exclusive deals here. Earn up to 0.8% p.a. interest with a Monthly Savings account under the Mighty Savers Programme! All you have to do is deposit a minimum of $50 every month into the Monthly Savings account without making any withdrawals. Get $100 credited into your OCBC CDA when you purchase an Endowment Plan (annual premium between $3,600 to $11,999) or Protection Plan (annual premium above $1,200). 40% off PA Protect for a parent, child and child rider bundled plan for the first year. PA Protect is a personal accident protection plan that protects you and your child against unforeseen events such as accidental death and total permanent disablement. It also helps to cover your child against animal bites and infectious diseases like Varicella (chickenpox) as well as hand, foot and mouth disease (HFMD). 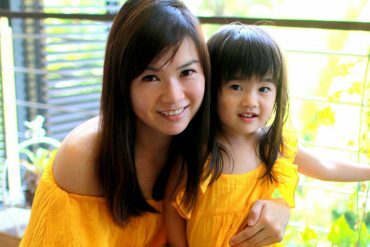 The OCBC CDA is perfect for parents who are adventurous and would like to let your little one venture out and explore since there are so many great deals with play areas and facilities. It’s also the one that’ll earn you the most interest! The UOB CDA is probably the one with the least hype. It offers a 2% p.a. Interest with no deposit cap on all balances, but that’s about it. 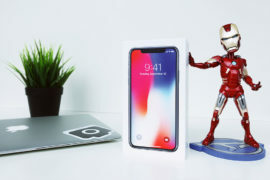 There’s an ongoing promotion where you can receive up to $800 in CapitaVouchers when you purchase an insurance policy for you or your child, but you’d have to contact a UOB Personal Banker to find out more about the validity period or terms and conditions. Now that you’ve decided on a bank, how do you apply for a CDA? 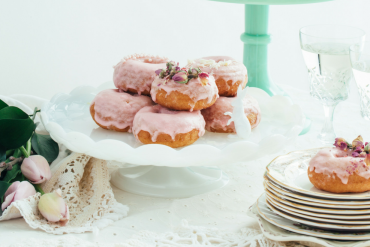 Depending on the bank you’d like to apply for, the methods may be different – but the easiest one (and applicable to all banks above) is through the Baby Bonus Portal. Before you start your application, you may want to check your eligibility first. All you need to do is to click on the “Check Eligibility” tool and answer a few simple questions about your baby! Once that is done, you can proceed to the “Join Baby Bonus” tool to enrol your little one by logging in through your SingPass. You can submit the form as early as eight weeks before your estimated due date, or you can do so after the birth registration of your child – I’d recommend the latter so that you have all the relevant information you may need. Congratulations on having your CDA set up! While waiting for the account to be approved, here are some tips that you may find useful to help maximise your CDA. Manage your finances well. 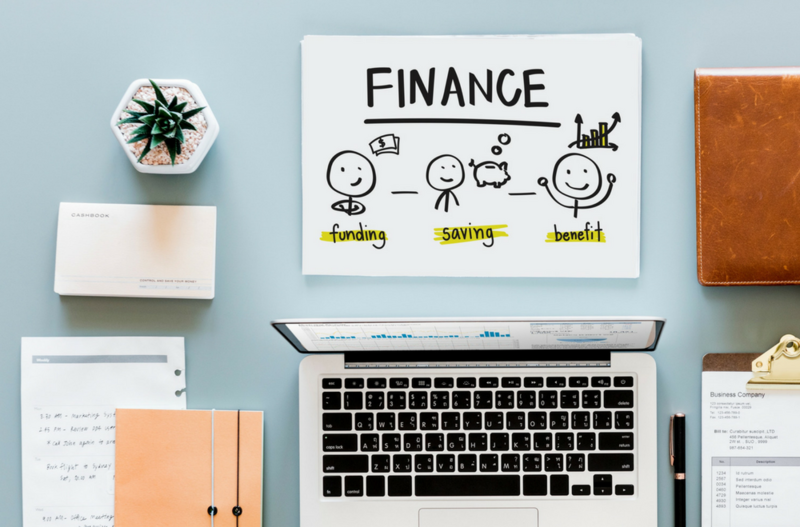 Plan ahead about what expenses you may be expecting for your newborn, get some daily necessities and logistics sorted out so that you can roughly gauge how much spare cash you’d have. This is crucial because you cannot withdraw your CDA balance in cash so you have to make sure you have enough for living expenses before you do any deposit. Deposit as much as you can, but just enough to reach the maximum cap for dollar-to-dollar matching. This is a small hack, but you can earn much more interest if you make a full deposit right from the beginning! Here’s an example to illustrate. The CDA First Step would give you a $3,000 headstart. If you do not do any deposit of your own, your interest per annum would be 2% x $3000 = $60. Note that per annum = per year, so you’re taking only around $5 in interest every month! On the other hand, if you were to make a deposit of $3,000 on your own, the Government would match dollar-to-dollar for another $3,000 – giving you a total of $9,000 in your CDA. Your interest per annum would then be 2% x $9,000 = $180. That’s three times more per year, or $10 more per month – and it’s just the base amount because it’ll increase as your balance increases from all the additional interest per month. Stop at the maximum cap (depending on your child’s birth order) because the Government won’t do dollar-to-dollar matching after, so you’re better off leaving that extra cash for daily expenses or putting them into a savings account that you can still withdraw from when necessary. Don’t be afraid to use it. Some parents leave the money in the CDA to grow in interest, and end up using cash to pay for most of their baby’s expenses. My advice would be to use the CDA whenever you can, because cash is way more flexible than the CDA – you never know when you’d need that cash. Moreover, the CDA interest rate helps you to grow it so you’d earn whatever you spent before your next CDA expense. When your child turns 13 years old and he/she still has an account balance in their CDA, this amount would be transferred to a Post-Secondary Education Account (PSEA) to help offset charges and fees at approved institutions so you don’t have to worry about losing your money. You can view the full list of approved institutions here. For more information on the Baby Bonus and Child Development Account please visit Baby Bonus.